Nieuw Land Erfgoed Centrum (Nieuw Land Heritage Centre), the official provincial archive of Flevoland. They also maintain the municipal archives of Lelystad. Address: Postbus 73, 8200 AB Lelystad, The Netherlands. Phone: +31 320 260 799. E-mail: info@nieuwlanderfgoedcentrum.nl. As far as I know, there is no provincial historical society. As most of Flevoland is new land (much of it was water a century ago) there are only a few local or regional historical societies. Internet resources Flevoland, an index to the available online resources for Flevoland. 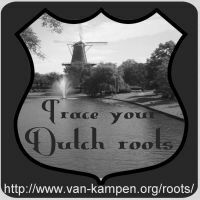 FamilySearch, the website of the LDS (Mormons) also has Flevoland records and scans. Graftombe has indexes of several cemeteries in Flevoland, others will follow. Register to order photos of tombs. Online Begraafplaatsen (Online Cemeteries) has images of tombstones of several cemeteries in Flevoland.